The posters must have been published in the previous calendar year, and can’t be self-promotional. The series of posters is considered as one submission subject to a single fee. Save image files of the posters as JPG (3600 x 1536 pixels, RGB, 72 dpi). (3600 x 1536 pixels, RGB, 72 dpi). These images will appear in the winners' gallery, if your design is awarded. in a smaller size and send the print-outs. 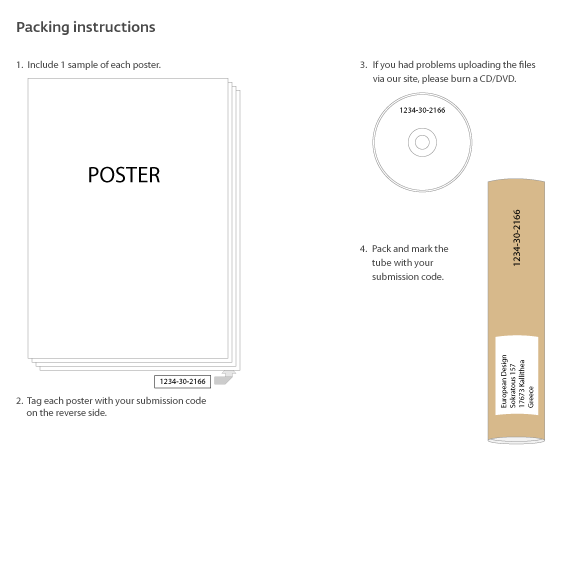 Place the posters in a tube or box and post it to European Design's Greek office (to arrive no later than March 8).